Norway has decided to convert old “Marjata” for maritime surveillance as NATO claims Russian submarine activities equals Cold War levels. A new giant spy-vessel is soon ready for maiden voyage to the Barents Sea. Norway’s military intelligence on Wednesday officially announced what the Independent Barents Observer hinted on last October; Norway will have two intelligence gathering vessels sailing in northern waters. “We have studied different options and concluded that [the old “Marjata”] will be converted to be a vessel for maritime surveillance. Currently the vessel is in Horten,” says Lieutenant General Morten Haga Lunde in a press-note. Haga Lunde is Chief of Norway’s military intelligence. Head of Communication for the military intelligence, Kim Gulbrandsen, says to the Barents Observer that the new “Marjata” will continue to have Kirkenes as homeport. “[The vessel] will be in place during spring,” Kim Gulbrandsen says. He says both vessels right now are at VARD Langsten shipyard in Horten south of Oslo. The press-note published on the portal of the Norwegian Armed Forces today says the old “Marjata” is re-named to “Eger” and will be ready for missions in the Norwegian Ocean during first half of 2017. It is not specified what kind of new equipment that will be installed on board. 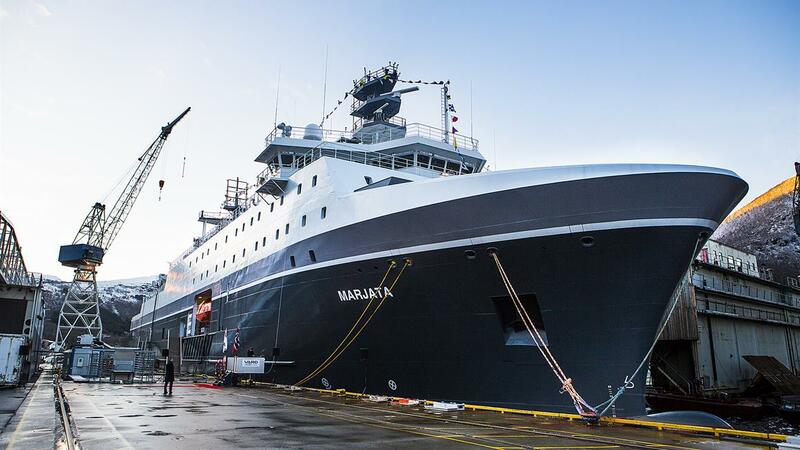 Norway’s new spy-ship, the forth in a row to be named “Marjata” is substantially larger than the former. At a cost of NOK 1,5 billion (€160 million), the 126-meter long and 23,5 meter wide vessel is one of the most expensive military investments in Norway in modern times. “[The new] “Marjata” represents renewal and innovation in many ways, but also a tradition through continuation of our presence in the Barents Sea,” says Morten Haga Lunde. The Lieutenant General underlines that the decision to build a new intelligence vessel was very important given today’s security policy situation. Russia is currently renewing its fleet of nuclear powered submarines sailing for the Northern fleet. Last year, the first 4th generation multi-purpose submarine of the Yasen-class was based at Zapadanya Litsa, Russia’s westernmost submarine base on the Kola Peninsula, only 55 kilometres from the border to Norway. Also new ballistic missile submarines of the Borey-class sails the Barents Sea loaded with nuclear weapons. For Norway, as a NATO-member, military intelligence gathering in the Norwegian Ocean and Barents Sea is one important tool to keep track of the Russian nuclear submarines that sail out from the Kola Peninsula on voyages in Arctic waters and the North Atlantic. With the two spy-ships, «Marjata» and «Eger», Norway’s maritime intelligence in northern waters will be significanly strengthened.